Around Christmas 2012, my brother told me he was running a half marathon the following summer. I remember him wearing some new blue workout pants and they looked pretty sweet. I like new gear, but I wasn’t going to buy workout pants without working out. And I didn’t work out. I thought he was crazy. But apparently that conversation planted a seed. Fast forward a couple of months to February (the absolute nicest month in Michigan – you know, the one where the sun never peeks out of the cloud and there’s usually a foot of snow on the ground) and the seed germinated. I thought, eh, I’ll run the half marathon too. After all, they give you a beer at the end of the race. All I have to do is go out and run 6 miles today. Then 7 next week. Then 8, etc. Why did I need to run during the week? One long run during the weekend would be great, right? That first 6 miles was brutal and I averaged something like 12:30/mi. I made it through the 7 miler, the 8 miler, the 9 miler … well, lots of black ice on the roads so I skipped that one, the 10 miler and the 11 miler. And that’s when I got pneumonia. I didn’t run again for about a month, but one week before the race I ran 8 miles. BAM! I’m good right? 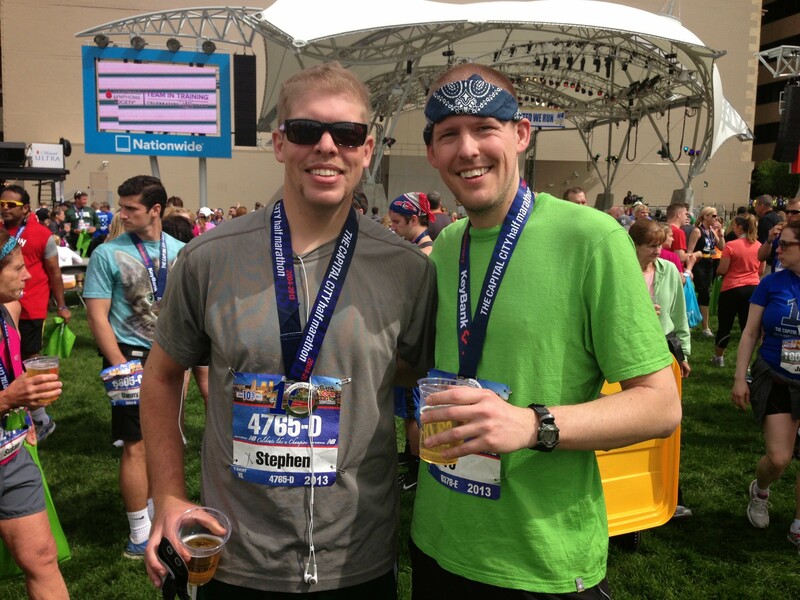 Mid summer 2013 – race day comes, it was in Columbus – the Capital City half Marathon. Macklemore had me all jacked up. We sang the National Anthem. Everyone was Boston Strong. And there were pyrotechnics. I was going to crush this. Things were great for 8 miles and then BAM. I hit the wall. Hard. I struggled through the next couple of miles and then saw runners ahead finishing. But I had to turn away from the finish line and run the opposite direction. That really took the wind out of my sails. I still had another 3 to go. But I chugged along and finished. I walked away from the finish line, feet killing me, finisher’s medal around my neck – towards a beer and a fried bologna sandwich. I was hooked. And that’s how this journey began. That’s me – the one w/o the sweet mustache. By the way, check out that sweet cat shirt on the dude behind my brother. I just noticed that – that made my night. This entry was posted in Racing and tagged cat, half marathon, pneumonia, running on October 9, 2015 by darkskyrunner. For me it all started with my brother too. Challenges from a brother are pretty hard to turn down. He beat me in round one, and I took round two. I’m still waiting on him for the rubber match though.